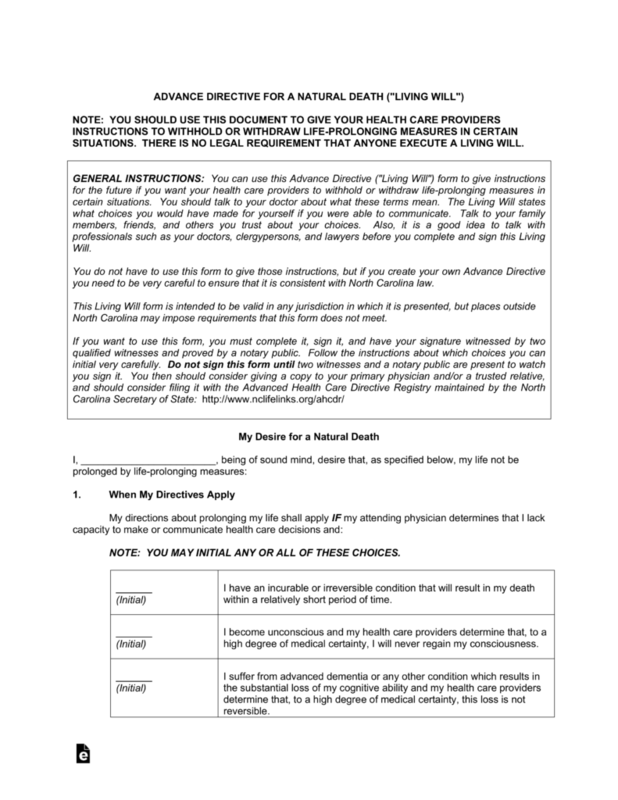 The North Carolina living will, legally known in the State as an ‘Advance Directive’, is legal document that instructs the medical team and/or an assigned health care agent, of a Declarant, how they should act on behalf of the Declarant, pertaining to their end of life wishes. This document must be notarized once completed. This document is revocable at any time as long as the Declarant is of sound mind to do so. Medical Power of Attorney – An agent that is assigned by a patient to make decisions on their behalf, and in their best interest, in the chance they should become incapacitated. Step 7 – Reliance of Health Care Provider Upon This Declarants’s Documented Wishes – Read the information in the paragraph. No action need be taken inasmuch as it will be acknowledged by witness at the end of the document. Nonetheless, the Declarant should read and agree. If at any point there is any confusion with regard to the meaning of any of this document, the Declarant may consider calling on the services of a qualified attorney. Step 9 – I have the Right to Revoke this Direction – You do have the right to revoke this document at any time, as long as you are of sound mind to do so. The moment you decide that this is not what your wishes are, let someone know immediately or contact your attorney. This is the protection of your rights. 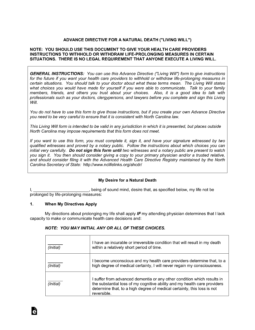 I understand that at any time I may revoke this Advance Directive in a writing I sign or by communicating in any clear and consistent manner my intent to revoke it to my attending physician. I understand that if I revoke this instrument I should try to destroy all copies of it. The remainder of the form must be completed at the hand of a licensed notary public, as required by North Carolina Law. The document will be acknowledged by the notary public’s state seal.